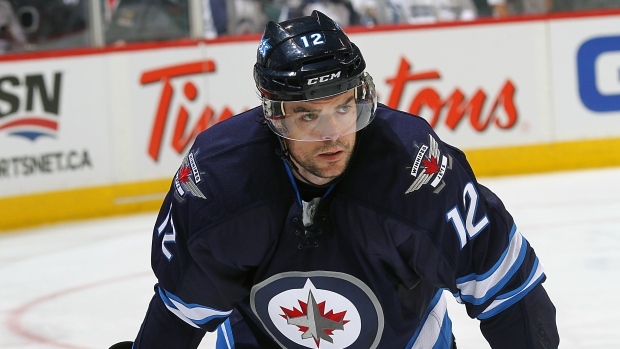 WINNIPEG — Drew Stafford is excited to get back into the playoff hunt, even if it means moving out of Winnipeg. The veteran winger was traded by the Jets to Boston ahead of Wednesday's trade deadline as the Bruins gear up for a post-season push. Winnipeg got a conditional sixth-round pick in the 2018 draft in return. "It's a great opportunity to get back into the mix. It's very similar to when I got moved (to Winnipeg)," said Stafford, who was traded to the Jets from the Buffalo Sabres ahead of the 2014-15 trade deadline. "It's a team that's right there in the hunt. That's why you play, to play in the playoffs. "For me to get an opportunity to help them win games. I couldn't be happier." Stafford has four goals and nine assists in 40 games with the Jets this season. He is a pending unrestricted free agent. The 31-year-old Stafford has 179 goals and 213 assists over his 11-year career. He's played for Buffalo and Winnipeg. Boston is third in the competitive Atlantic Division and trying to fend off the hard-charging Toronto Maple Leafs and Florida Panthers while trying to gain on the second-place Ottawa Senators. Stafford isn't sure what his role will be on the Bruins, instead having to focus on the logistics of switching teams. "You get the call and you have to pack up and get out there as soon as possible," said Stafford. "Whatever will happen will happen."